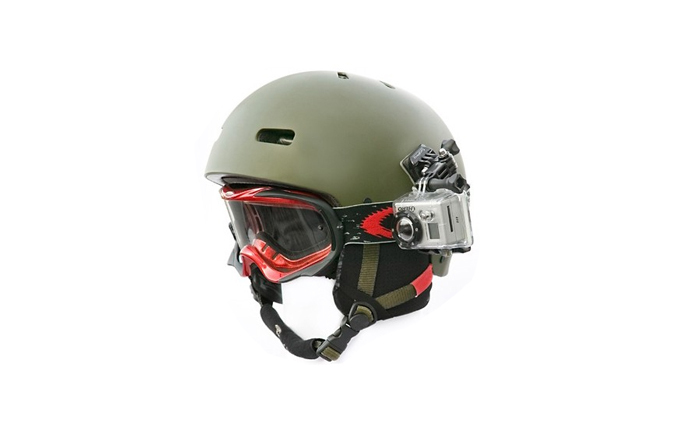 Don’t let the quirky, retro looks deceive you, the Go Pro HD Helmet Hero is top notch technology: full HD 1080p at 30 frames per second and also 960p and 720p at 30 fps. If you want your action replayed in slo-mo, there’s a 60fps option in 720p and also one in lo-fi WVGA setting. Shooting at full HD 1080p the camera gives an angle of view of 127°. Although this is less than either the Contour HD or the X170, drop down to 720p and the angle increases to 170°. Like filming, a lot? Well the downside of HD is that the file sizes get fat quickly. That’s not a problem with the Helmet Hero as it can take up to 32GB SD cards. That’s enough for nearly four and half hours of footage, even at full HD 1080p. 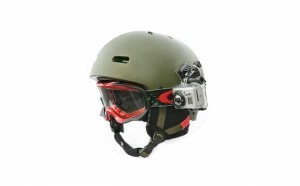 The Helmet Hero comes with a removable polycarbonate and stainless steel housing to protect the body. 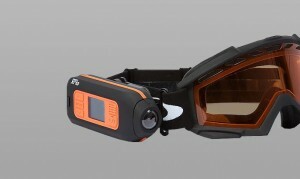 This housing is not just shockproof, not merely dust-proof, it is fully waterproof down to an impressive 60m. That’s deeper than you can go without specialist dive training and kit so don’t go trying to test it out unless you really know what you are doing. 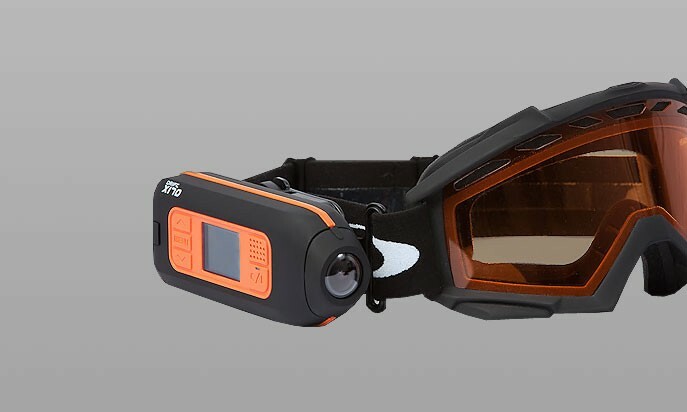 The Helmet Hero comes with a head-torch style fixing mount for your lid, a strap designed for vented cycle helmets, a selection of adhesive mounting pads and a pivoting side-arm. There are also a number of other mounts that can be bought so the camera can be fixed onto mountain bikes, cars or surfboards. Cold can severely shorten battery life, but there’s a innovating feature on the Helmet Hero that warms the battery chamber so that you won’t run out of juice when filming in sub-zero temperatures. One of the best features of the X170 is its 1.5-inch screen. It might not be massive but just having a display at all puts it ahead of the competition. Not only does it mean you can review footage to ensure you’ve got the shot, you are far more likely to get the shot you want in the first place. Mounting the camera, say, on the handlebars of a bike, is simple stuff when you can use the screen to line up your shot. The lens gives a panoramic 170° shot angle. 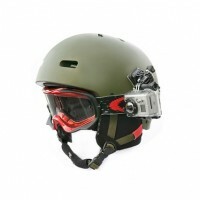 A head cam captures high-speed action as you scream along doing your chosen adrenaline sport, and the wider the angle that the lens captures, the faster you seem to be going. This is because it’s not just the trail in front of you that the camera films but the stuff at the side too. This gives perspective and makes the shot more interesting to watch. On the bottom of the camera there is a standard screw fitting and this is used to mount the X170 where you need it. A generous array of mounting options come out of the box you bought it in: there’s a goggle mount, a handlebar grip, a head strap, a helmet grip, a universal clip plus industrial strength sticky pads and an adhesive velcro pad. The best places to fix the X170 so that it gets a great shot are not always the easiest to reach, but even then, controlling this cam is easy. It comes with a radio controller with two big start and stop buttons that are simple to use even when you are wearing gloves. The X170 does not shoot in HD. The mic is also a little sensitive to wind noise, not ideal when you are out riding your mountain bike or snowboarding down an Alp. That said, the video quality isn’t bad and with the X170, what you might loose in terms of picture quality you more than make up for with its functionality. Not simply able to shoot film in impressive Full HD 1920 x 1080p at 30 frames per second, but also a range of other formats so that footage can be tailored to specific needs. Want slo-mo? Switch to 720p at 60 fps and the results are dream-like. No matter what you shoot in, the images are clear and sharp. There are four configuration settings; exposure, light metering, contrast levels and microphone sensitivity to help you get the best out of the ContourHD no matter what the light or sound conditions are like where you choose to film. However, in order to tweak these settings the cam needs to be connected via USB to your Mac or PC. Pictures only tell half the story and for a film to be great it needs quality sound too. The mic on the ContourHD provides clear audio recordings and wind noise can be eliminated using the microphone sensitivity setting. The 135° lens is reasonably wide and does a good job of capturing some peripheral as well as central action, so giving perspective to the action. It is mounted on a 192° swivel and has two lasers to aid shot alignment. VholdR do a range of different mounts for helmets, goggles, handlebars and other fixing points. Not all come with the camera and if what you want isn’t in the box you’ll have to dip into your wallet again to get it. There is 2GB microSD included and it will support both microSD and HD cards up to 16GB. 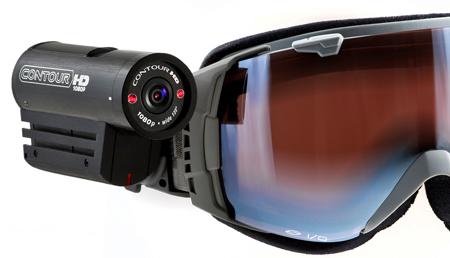 At 116g, this head cam is favourably light. It is also compact, durable and water-resistant body. The aluminium body has been manufactured to be dustproof, shockproof and impact resistant.